And what an extraordinary trip it was. 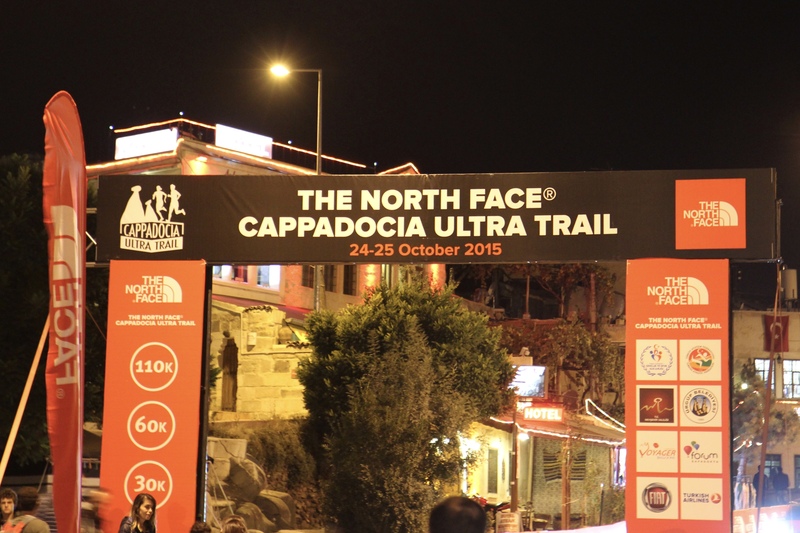 After 11 months of planning, training, stressing, talking, blogging, tweeting and generally going on about it, I finally got to line up at the start line for, and (spoiler alert) complete, the Cappadocia Trail 60km. It’s taken me a couple of weeks to write this as I wanted to do it justice, and to be honest I’ve been struggling to find the words to describe the experience. I think that I’ve also been putting it off because the reason for starting the blog in the first place has now gone, so this post is an ending of sorts, and I hate saying goodbye. 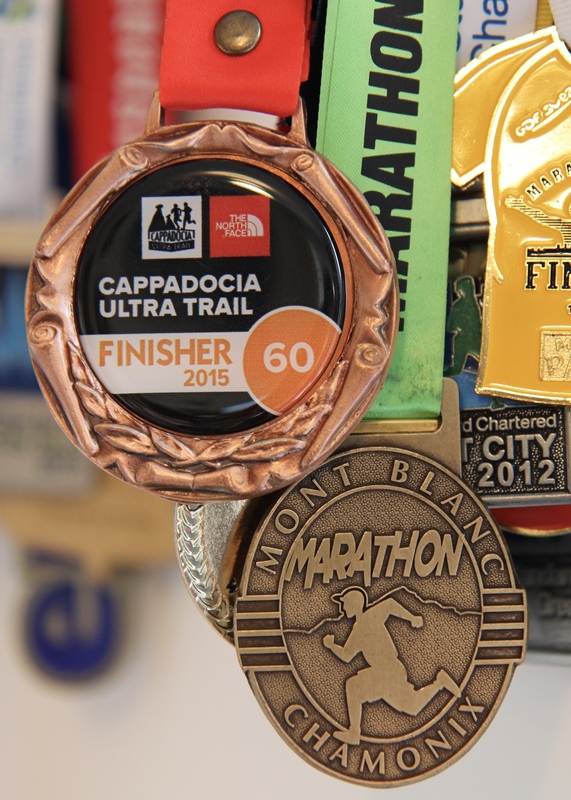 This is a bit silly really, as I’m going to keep the blog going, and am already planning what I am going to do next, including looking at races in exotic locations like Patagonia, Andorra, the Canary Islands and, er, Evesham. but they all seem very far away now. 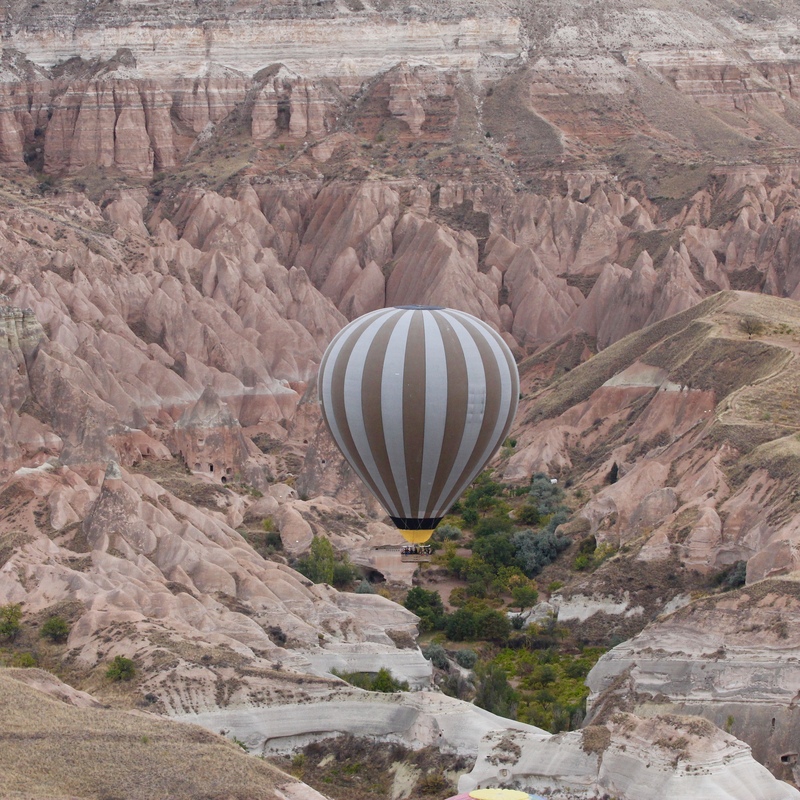 Anyway, back to Cappadocia. The weekend started very well, if not a little dauntingly, as I met two Brits that were hoping to win the 110km Ultra Trail – Robbie Britton (@ultrabritton, pictured below) and Paul Radford (@PaulJRadford), together with seasoned trail runner Ben Cox (aka Papa Ferret, @trailferret) and potential winner of the 60km Natalie White (@natsmountain). A great thing about participating in a niche sport like ultra running is that you get to rub shoulders with, and get tips from, seasoned pros, and rather than looking down on newbies, experienced competitors always seem genuinely pleased that another person has found the sport. 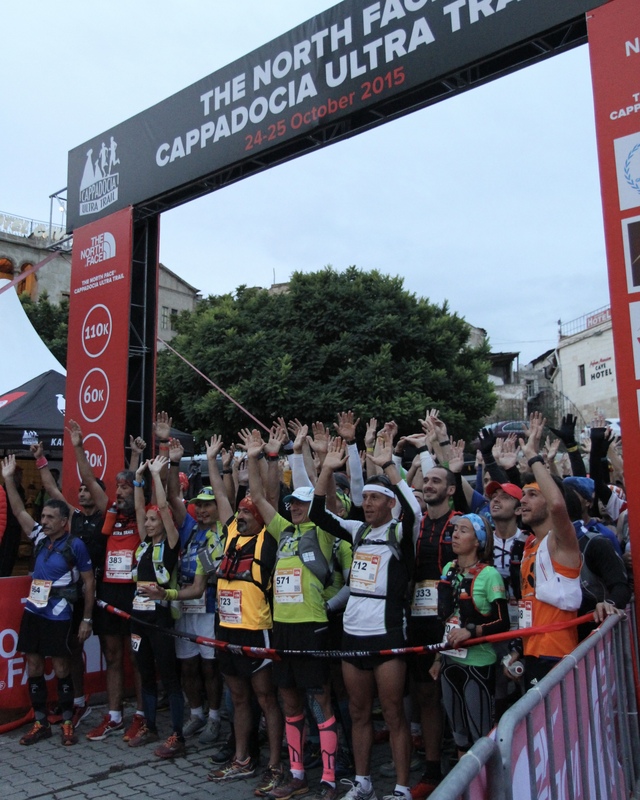 There also appears to be wonderful camaraderie among ultra runners, perhaps because of the difficulty of the challenge ahead, with professionals in most cases finding the race as tough as first-timers. So, with my head filled with sage advice, and belly filled with carbs from the pasta party laid on by the organisers the night before, and the breakfast laid on by the hotel at 5am, I set off for the race of my life, thankfully avoiding the spectacular, and probably very expensive drone crash just after the start line. The first few miles were fairly gentle, particularly as I stuck with some 110km runners (the 110km Ultra Trail started at the same time and followed the same course as my race) to avoid the temptation to go off too fast. Things got a lot tougher about 45 minutes into to the race though, in large part because it started tipping it down. The course got progressively more difficult too, with wide open plains turning to tight wooded trails. That said, it would have been nowhere near as challenging as Mont Blanc, had it not been for the rain, which turned parts of the course into fast running streams and put many a better runner than me on their arse. Unlike many such better runners, I actually really enjoyed the rain, and definitely now understand why kids, and Peppa Pig, love splashing in muddy puddles (still don’t get me started on Daddy Pig though). I also felt very smug that I took the organisers’ advice and wore proper trail shoes (Salomon Speedcross 3, in case you’re interested). The terrain during this part of the race also made it interesting, with the odd cave to crouch through, fallen tree to climb over, ladder to climb up or down or crying dog to avoid. Before I knew it I was past the third checkpoint at 35km and, I can’t believe I’m saying this, but I couldn’t work out whether I was pleasantly surprised by the relative lack of ascent and descent, or missing the up & down of Mont Blanc. By this time it had stopped raining though, my thoughts were diverted by the breathtaking and other-worldly scenery. 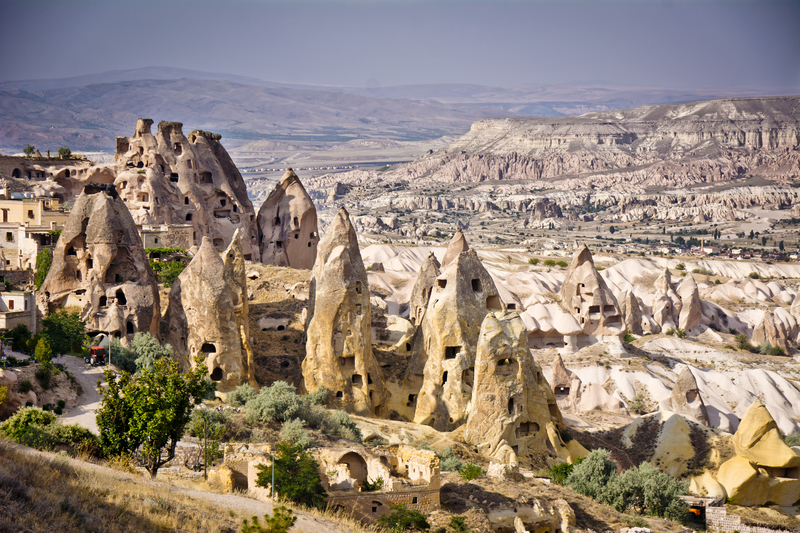 Although the internet tells me that it is not the case, and the internet is always right, I still can’t quite believe that Tatooine is not Cappadocia (Tatooine being Luke Skywalker’s home planet, in case you’re not a Star Wars fan). Shortly after checkpoint 4 I definitely was not missing uphills, as they had kindly laid on a monster hill for us. Thankfully, I met another experienced and inspiring ultra runner, Lucja Leonard (aka Running Dutch, @Runningdutchie), who took my mind off my aching legs and kindly took the photo on the right. Once the climb was over with there was a fairly long but stunning stretch along a ridgeline, and then an uninspiring few kilometres into Urgup. The finish line somewhat crept up on me, so I barely had time to look for Camilla and make my sprint finish. and learning as you go – you’re choosing a numb existence. Three weeks after completing Marathon du Mont Blanc, I’m still struggling to put the experience into words, but it’s about time that I gave it a go. 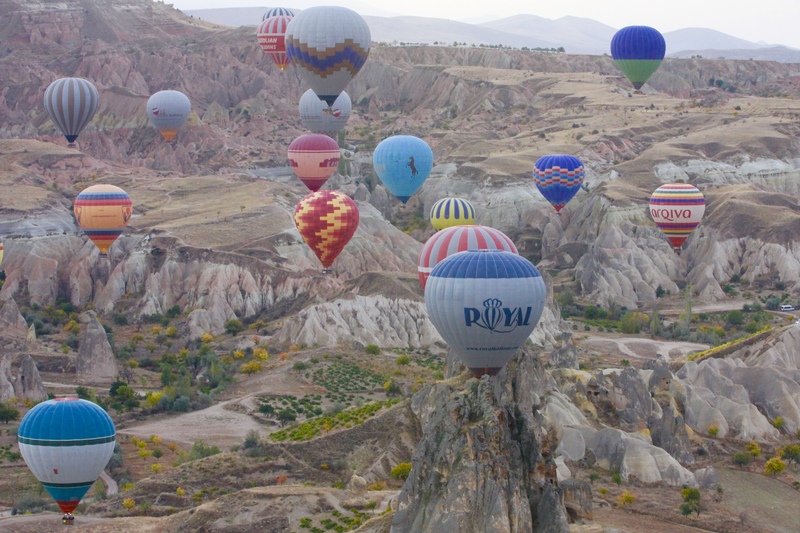 To be honest, I’ve been struggling with a post-race downer, and I need to re-focus with Cappadocia only 12 weeks away. In fact, Alan has well and truly re-surfaced, although as I’m in Norwich this weekend (complete with incorrectly pedestrianised city centre, and giant Nazi-saluting copper “dogs”) that was inevitable. In my last post (MdMB Part I) I described the festival atmosphere of the weekend, and some of the many reasons why I fell in love with Chamonix. What was surprising though was that my favourite part of the weekend wasn’t the build-up, watching the other races, or the post-race celebrations, but the race itself. Just in case it isn’t already clear, I love running, and spend most of my life doing or talking about it. Mont Blanc is however the first race that I have enjoyed the whole way through. In every race before MdMB the negative side of my brain had at some point, no doubt egged on by my feet, legs, back and chest, ruined the fun for the rest of me. It always started with polite questioning – “Are you sure you’re ok?” “Aren’t your legs starting to hurt? Haven’t those gels made you feel a bit sick?”, but then developed into recriminations, histrionics and threats of strike or reprisals. These questions were never even asked during MdMB. In fact, when I finished I had exactly the same feeling as I did at the end of our wedding, that it ended too quickly and that I wanted to go back and do it all again. The race started in the centre of Chamonix at 7am, just as the sun was rising above the mountains. The start area was packed with the 2000+ runners and their supporters, together with a surprising number of committed locals waking early on a Sunday to cheer on the runners. With only a limited amount of faffing, we were off heading through the narrow streets of the town. It felt great to start, after three days of watching other people run and 8 months of build-up. I tried to make the most of the flat pavements, but we were soon onto the gently undulating fire tracks and out towards Argentiere. Although uphill, the first few miles were fairly gentle. Rather than stick to my original plan of taking it very easy, I took the advice of a MdMB veteran (more on which shortly) and tried to get as far forward as I could, to avoid the worst of the traffic when the course got narrower. Actually, this was my only gripe of the weekend; there were just too many people on the course. It was very difficult to keep to your own pace, as you were either stuck in a bottleneck or getting jostled from behind. It actually became dangerous at a couple of points where you had people trying to overtake on single-track paths where one wrong step could end your race, or in some places, your life. Although it was great that there were so many people doing the race, in my humble opinion they have to start in waves next year, just as they did with the Vertical KM. 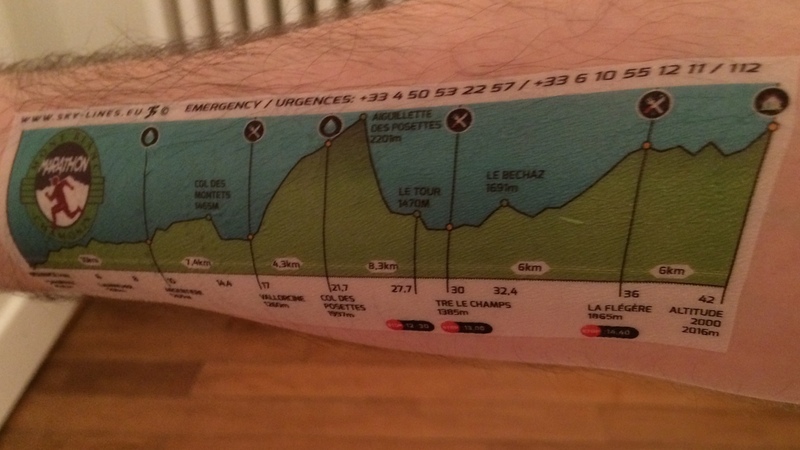 Apart from twisting my ankle on possibly the flattest section of the course, the first 11 miles flew by, and before I knew it I was at the aid station at the bottom of Aguillette des Posettes, faced with the 1km vertical climb that I had been dreading since I entered the race. Thankfully, you could only see the start of it from the aid station, and because of the tree cover you did not at any point have to look from bottom to top. 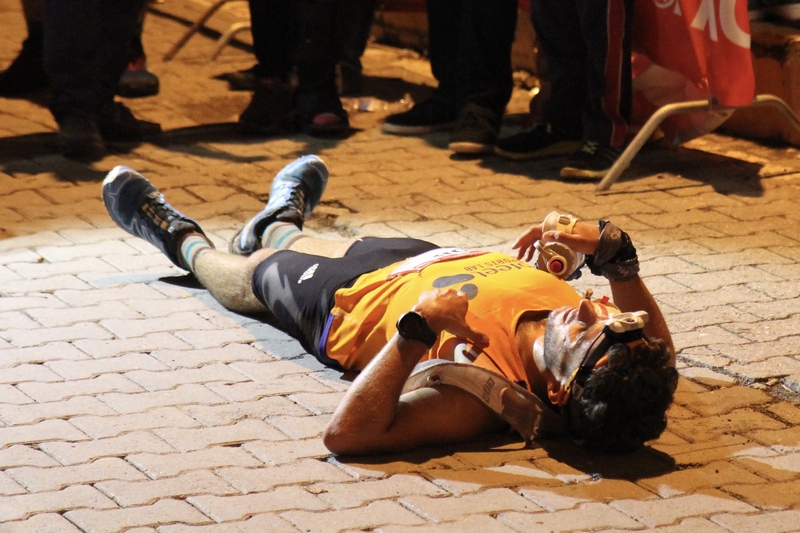 It was undoubtedly the toughest hour or so of my running life, and every time I thought I was at the top there was another slope in front of me. Bewilderingly though, I really enjoyed it. There was no question of being able to run up it, so it was simply a matter of putting hands on knees and slowly edging up and diverting my attention from my burning glutes, quads and calves. As this was the slowest part of the course, I could chat to the other “runners”, which definitely passed the time. This was particularly the case with Charlotte, who I had met the day before at the Expo. As well as being a veteran of the race and Chamonix resident, she is also one half of the team behind Sky Lines (http://www.sky-lines.eu), who had the simple but ingenious idea of making temporary tattoos containing all of the details of the race (see above, modelled by my puny forearms), so she quite literally knew the course like the back of her hand. Indeed, just as I was starting to struggle up the hill Charlotte pointed out to me that once we were at the top, we were on the home stretch. Seemed an odd thing to say with just under half of the race left, but with the hardest part over, it made sense at the time. If that wasn’t enough of a kick, the view at the top, massive cliché alert, made all of the effort worthwhile. The rolling green slopes, uninterrupted view of the Mont Blanc Massif, thin clear air, the snaking line of runners and the old man on top of a trailer playing an electric guitar is now the place I go to in my head when things start to get too much. We then headed downhill, at the same steepness as we came up. It was absolutely petrifying, but also incredibly fun. It felt great to be travelling fast, and because I was concentrating on every step, it made the time pass even quicker. With the most challenging part of the run over with, we headed back to civilisation and through Le Tours. It felt very odd (and not in a good way) to be back on tarmac, but it wasn’t long before we doubled-back on ourselves into the tree line and to the very welcome aid station at Tré Les Champs. The station was buzzing, and I would have quite happily stayed and chatted to the crowds, eaten cheese and saucisson and listened to the band playing Bob Marley. But I had a race to finish. Next came a much shorter, but deceptively more technical peak than the first, with unstable rocks, twisted tree roots and other potential race-enders. Apparently, this section was included this year after previous complaints about the race not being technical enough. Thanks for that, last year’s runners. With the tricky peak at Le Bechoz dispensed with, there was a long, slow climb to the final aid station at Le Flégére. This was the only part of the race that dragged. There was less to look at, it was baking hot with no shade, and I’d run out of water. But, near the top of the climb, I caught up with my cousin, mate, and Bear Grylls, James (he of the Rocky training regime), who I’d lost at mile 10. We made it to the final aid station together, and after a quick coke (cola, to be clear), sit down and jug of water over the head, we went out together for the final 6km to the finish. In previous races, I have been accused of abandoning previously made plans to finish as a team in search of personal glory. But this time it really was by accident, honest. As James and I set out from the aid station we agreed that it would be brilliant to cross the line together. James, for different reasons, also had a horrendous 2014, and it was just as much of an achievement as it was for me to be on the start line. After a little time to let the coke go down, I gave James an inclined nod to the front of us, being the universal sign for, “let’s push on”. I am pretty sure that James nodded back, so for the first time I took the lead and overtook a couple of people in front of us. 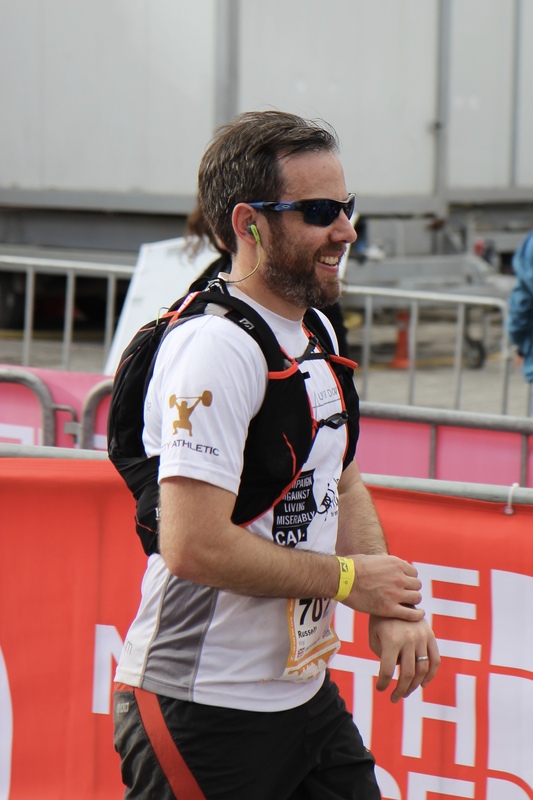 I’d suddenly got a massive burst of energy, buoyed by the fact that we could now see and hear the finish line in the distance, so kept overtaking at every opportunity. I was concentrating on this so much, however, that I forgot to check behind me. By the time that we got to the final switchback up to the line at Planpraz, I realised that I couldn’t see James anywhere. The path was too narrow to stop, so I could do nothing else but push on. Before the race, I’d warned Camilla that I’d be a mess, physically and mentally, when I crossed the line, and fully expected the last 18 months of awfulness to come flooding out. As is nearly always the case in life, it did not conform to expectations, and all I felt was elated, the only negative thought being a sense of disappointment that it was all over, 06:54:10 after it started. Thankfully too, James crossed the line a couple of minutes later, so we were able to head into the recovery tent together, where some genius (in fact the geniuses at Micro Brasserie de Chamonix (http://www.mbchx.com)), put a beer tap at the end of the line of bottles of water and recovery drinks. It was hands down the best beer I have ever tasted, although disappointingly they refused to fill up James’s 500ml flask, or my hydration pack with the stuff. Charlotte, my race companion/pacer/coach also came in just after us, so hit her target of sub-7 hours. Rev, the third member of the UDR trio, also had a great race and came in well below the time he was predicting, and loved the experience almost as much as I did. Will road shoes do? NO. Even though it was dry this year there is no way that I would have stayed on my feet without my heavy duty Salomon Speedcross 3s. What about poles? A controversial subject. I have never tried them, and coped absolutely fine without. I was pretty fed up by the end of the race at being jabbed in the leg by them though, or by people turning a dual-track path into a single-track by spreading their arms as much as possible. So if you get on with them, use them, but be prepared to be hated by the people that don’t (mainly at jealously during the uphills). Should I do much hill training? As I’ve mentioned before, I only did one real mountain run before the race, so you can cope without, but the more you do, the more confident you will be on both the up and downhills. What about the altitude? 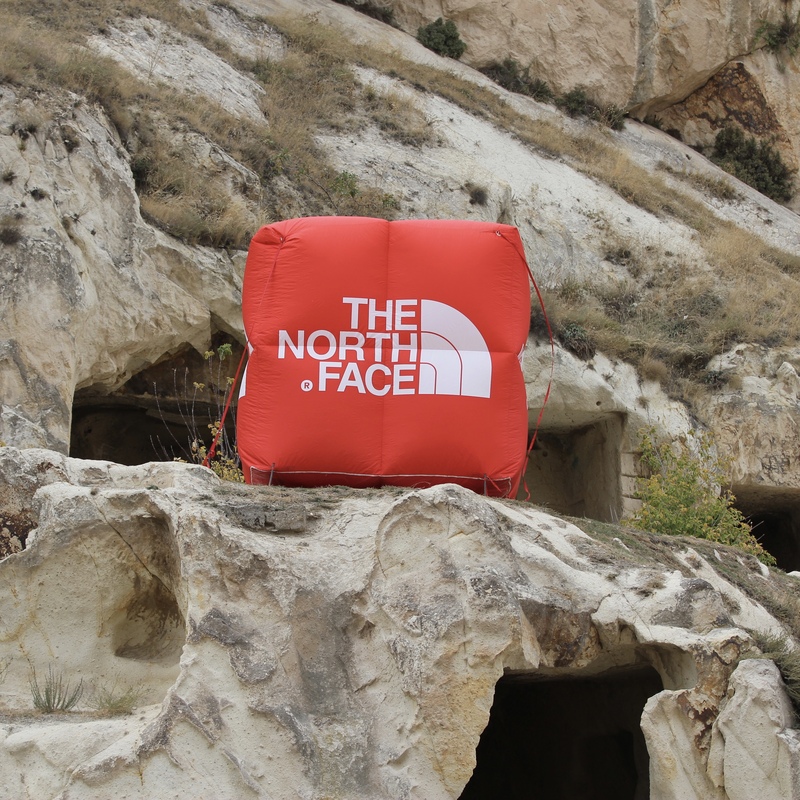 From our collective experience, it’s definitely a good idea to do some altitude training if you can. James really struggled, and actually had to stop at some point. As I was lucky enough to work next to, and be supported by, The Altitude Centre, it didn’t bother me at all. How hard is it? Very, particularly the first climb, but if you can do a flat marathon, and get some practice on hills, it’s definitely doable. Should I do it? If the answer is not obvious already, YES YES YES. I’ll see you next year, although I may well be doing the 80km.